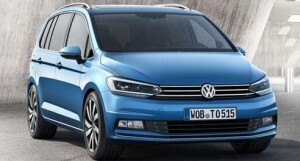 The new Volkswagen Touran (2016) is a seven seat car sharing a chassis with the VW Golf it sits between the Golf SV and the larger Sharan. This new version is slightly more sleek though has the familiar box shape of the outgoing model. 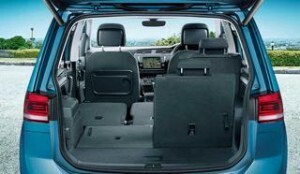 The Touran has three individual seats in the second row, that can house three car seats, and two good size seats in the third row and even with all seats in position it has room in the boot for a pushchair, not something all cars trading as seven seaters can offer. 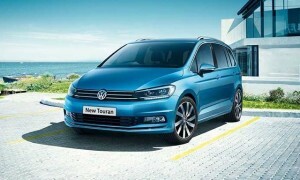 The Touran comes in four trim levels: S, SE, SE Family and SEL. All models get a 8-inch colour touchscreen infotainment system, DAB digital radio, bluetooth phone connectivity, a second row of seats that can be slid back and forth, a plethora of storage spaces and air-conditioning. If you upgrade to SE trim, you get 16 inch alloy wheels, front and rear parking sensors, privacy glass, adaptive cruise control and folding tables on the back of the front seats, while SE Family gets a panoramic sunroof and Discover Navigation. Top SEL trim is the luxurious one with 17 inch alloy wheels, 3 Zone Climatronic air conditioning, APP Connect for Aple Carplay / Android Auto and nicer sears. 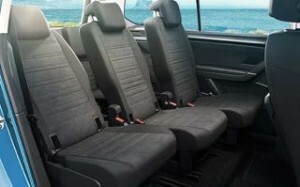 Heated seats are a £210 extra across the range. The engines are all excellent fo those that prefer diesel economy the 1.6 litre diesel is available as a six speed manual or seven speed automatic (DSG), while it only offers 115 bhp the smoothness and even delivery of the available power makes this engine surprising capable even fully loaded, 0-62 in 11.9 seconds and top speed is 116 miles per hour. This engine is all about economy and it can return 64.2 miles per gallon as a manual or 65.7 miles per gallon as a DSG automatic. A 1.2 litre petrol also with 110 bhp is an option for those that do not want a diesel engine or opt for a more cost effective Touran, it can hit 62 in 11.3 seconds and return 52.3 mpg and is only available as a six speed manual. If you tow a caravan (1800kg braked tow limit) the 150bhp 2.0 diesel is the engine for you, 0-62 in 9.9 seconds and a claimed economy of 64.2 mpg as a six speed manual or 60.1 mpg as a six speed DSG Automatic. The 1.4 litre petrol is being phased out by VW in favour of a new 1.5 litre offering, if you can get hold of one this quarter it offers excellent economy at 49.6 as a manual or 51.4 as a DSG auto, the 148 bhp makes for an powerful companion, 0-62 in 9.5 seconds. Only avaialble in top SEL trim from £1199 Advance Payment.